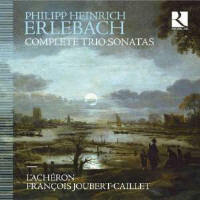 What a warmly serene introduction to the music of Philipp Heinrich Erlebach (1657-1714) we’ve been given here by François Joubert-Caillet and his ensemble L’Achéron. While this is down in part to the repertoire itself – repertoire in which ‘tenderness is blended with luminous majesty’, as Joubert-Caillet aptly puts it in his booklet notes – there’s no question that a good 70 per cent of the effect is down to what L’Achéron themselves have done with it. Erlebach was Kapellmeister at the court of Schwarzburg-Rudolstadt from 1681. Not much of his music survives, thanks to a fire at the castle in 1735 which claimed all his manuscripts. However, an exception is this volume of trio sonatas he published in 1694 for violin, viola da gamba and continuo, which melds the Italian taste for virtuoso violin-writing with the French love of the viol and the dance suite, all wrapped up in Germanic architecture that prefaces each dance sequence with a sonata. Erlebach also tweaks the upper-line forces for effect, with two of the sonatas requiring the violinist to use scordatura (alternative tuning of its strings), and one requiring a violino piccolo. The opening of the album is particularly serene, thanks to L’Achéron’s decision to start not with No 1 but with No 4. While No 1 in D is certainly very lovely, No 4’s more luxurious and expansive C major beauty makes a more compelling entry into Erlebach’s ‘tender and luminous’ world. The ordering continues equally intelligently – Nos 6, 5, 1, 2 and 3 – so the programme climaxes with the one sonata where Erlebach replaces the standard short, final gigue with a larger-scale and more noble Chaconne. L’Achéron’s playing style cements the impression: majestic and amorous of tone, with a soft-edged, ample yet transparenttextured sound that’s humanised further through little tugs and pushes of metre and hairpin dynamic bulges. As such, it offers a very distinct alternative to the lighter and more twangy sound to be heard from El Arte Musico’s attractive recording (Verso) or the less sustained notes to be heard on Rodolfo Richter’s courtly readings for Linn. In other words, these readings constitute an austerity-free zone; and, coupled with the thoughtful ordering, I’m very taken by them indeed.